Additionally, local railway service is also provided by Southern Railway of British Columbia (SRY), a transporter of freight in British Columbia’s Lower Mainland and Fraser Valley. CN Rail and CP Rail service the on-dock rail facilities at the port’s container and cargo terminals. Loading and unloading on dock saves transit time with less handling, reducing potential damage and costs for the shipper. 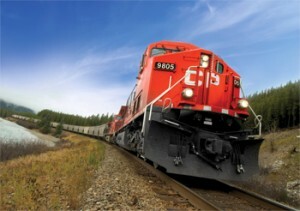 CN Rail and CP Rail have key sections of track to improve the fluidity of rail operations. CN Rail and CP Rail offer double-stack intermodal service across Canada, including Toronto and Montreal, plus direct service to Chicago and other North American markets. Both railways have excellent connections with major U.S. railways.